NEW YORK, USA -- Ukraine, seeking to access a $15.6 billion International Monetary Fund bailout frozen because of government unwillingness to raise household natural-gas prices, is considering higher tariffs from 2013, a minister said. The former Soviet republic, which faces parliamentary elections in October, may be willing to raise costs in stages starting next year, Foreign Minister Kostyantyn Gryshchenko said yesterday in an interview. The Washington-based lender has demanded the increases to narrow the budget deficit by trimming losses at state-run energy company NAK Naftogaz. “We aren’t ready for any steep rise,” Gryshchenko said in the interview at Bloomberg headquarters in New York. Ukraine wants the IMF lending to resume “as soon as possible,” he said. The IMF halted Ukraine’s latest bailout, which it approved in 2010, last March after the government refused to raise gas tariffs. Efforts to placate the lender by reducing the price paid to Russia for the fuel by a third have so far failed. IMF officials are in Kiev May 21-28 for talks with the government. The hryvnia fell 0.6 percent to 8.0638 per dollar as of 11:06 a.m. in New York, the biggest drop since Jan. 21, 2011. Ukraine stocks declined to their lowest in almost three years after German confidence fell more than economists forecast. Ukraine’s government will continue to seek a discount on Russian energy imports, which it deems too expensive, according to Gryshchenko. “We’re overpaying billions of dollars for Russian gas supplies and that creates pressure on our financial system,” Gryshchenko said. 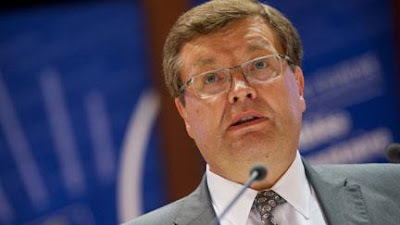 It’s in Russia’s interests to change the gas accord as demand weakens when prices rise, Gryshchenko said. Vladimir Putin’s return this month for a third term as Russia’s president increases the chances of negotiating a discount, he added, without elaborating. Ukraine receives fees from Russia for gas that transits its territory en route to Europe and generates exports revenue by selling commodities such as grain, steel, chemicals and machinery. Economic growth will slow to 3 percent this year in 2012, less than the government’s 3.7 percent forecast and last year’s 5.2 percent expansion, because of weakening export demand, the IMF said April 17 in its World Economic Outlook report.